CNN recently reported that Pope Francis' crusade against corruption in the Catholic Church, including an overhaul of the scandal-scarred Vatican Bank, has put the new pontiff in the Italian mafia's crosshairs, according to two organized crime experts. "The strong will of Pope Francis, aiming to disrupt the gangrene power centers, puts him at risk. He disturbs the mafia very much. I don't have precise information about a plan of the mafia against Pope Francis, but if I did, I wouldn't say." -- Nicola Gratteri, a top anti-mafia prosecutor in Italy, told CNN on Thursday. Gratteri, a deputy prosecutor in Reggio Calabria, a city in southern Italy, is a well-known foe of Calabria's notorious mafia, known as 'Ndrangheta. He explained the mob's anger with the Pope centers on the Vatican Bank, which the new pontiff has tried to reform, according to experts on the Italian underworld. In May, the Vatican Bank, officially known as the Institute for Religious Works, issued its first-ever report on money laundering, an apparent attempt to improve its financial transparency. The 64-page report details the Vatican's efforts to crack down on money laundering in particular, though it made no mention of mafia connections. The report found six charges of "suspicious activity" within the past year. According to CNN, in June, the Pope established a five-person papal commission to investigate the activities of the Vatican Bank, which has been under pressure from international finance authorities to clean up its murky business practices. A month later, Italian prosecutors arrested a priest who worked as a financial analyst for the Vatican, accusing him of trying to help smuggle tens of millions of euros across Europe using a private plane in July 2012. That same month, two top officials at the Vatican Bank resigned, as Italian prosecutors continued their three-year investigation into the bank. The Catholic Church and the Italian mafia have a long and complicated history, said Antonio Nicaso, an expert on organized crime in Italy and co-author with Gratteri of a new book called "Holy Water," which explores the relationship between mobsters and the church. Underworld gangsters often paid for local church repairs or bankrolled feast day celebrations for Catholic saints, Nicaso told CNN. In exchange, Catholic officials kept silent about their illicit deeds. More recently, the mafia used the Vatican Bank to smuggle money, Nicaso said, though he offered no specific evidence. The Pope's reforms threaten that arrangement and will anger organized crime. "There are so many ways to kill a pope. They have to be careful. But in the history of organized crime, whenever they had to remove an obstacle, they never thought about the consequences." In addition to the Vatican reforms, Francis in his speeches has taken aim at corruption, saying on Monday, for example, that a Christian "who gives to the church with one hand but steals with the other hand from the country, from the poor, is unjust." The Pope then paraphrased Jesus, saying that it would be better for a corrupt person "if a millstone were put around his neck and he be thrown into the sea." (CNN) -- (November 7, 2013) It was the embrace that melted hearts worldwide. 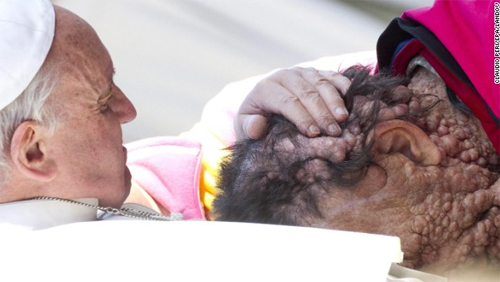 Pope Francis, pausing for a moment to pray and lay his hands on a man with a disfiguring disease. The man gently burying his head in the Pope's chest, his many facial tumors visible. His encounter with the ailing man occurred in Vatican City on Wednesday at the end of the general audience, which had about 50,000 attendees. Images of the Pope's embrace in St. Peter's Square went viral on social media. The man the Pope comforted suffers from neurofibromatosis, according to the Catholic News Agency. The genetic disorder causes pain and thousands of tumors throughout the body. It leads to hearing and vision loss, heart and blood vessel complications, and severe disability from nerve compression by tumors. The disease is associated with Joseph Merrick, known as The Elephant Man, who became a famous figure in London society and the subject of a play and film. But in the 1980s, a study by Canadian geneticists found that Merrick instead suffered from Proteus syndrome. The event Wednesday marked the latest in a series of memorable encounters for the Pope. 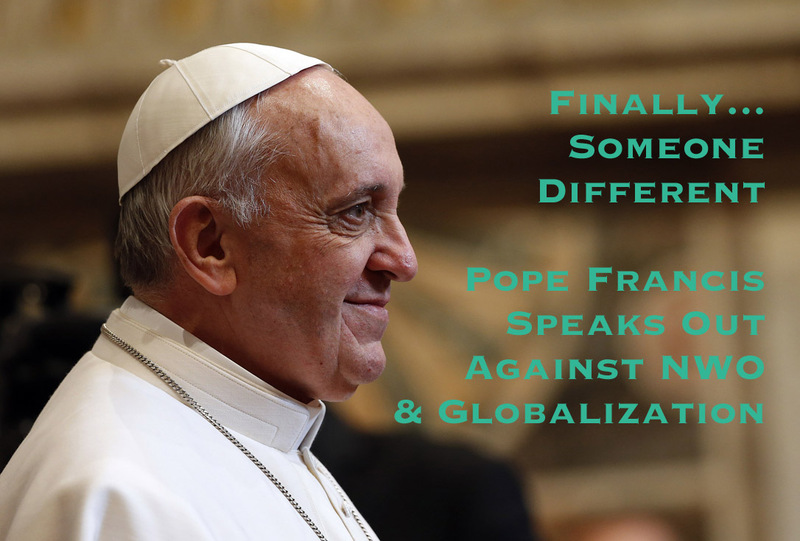 (October 25, 2013) -- The new Pope Francis has been outspoken against the global culture of materialism, angering those who support the New World Order, such as the Illuminati and Globalists Bankers. He recently released the first ever financial report of the Vatican Bank and has just recently sached a bishop, Bishop Franz-Peter Tebartz-van Els (known as the "bling Bishop") for being too wordlly and extravagant in his spending of Church money. The Vatican on Wednesday indefinitely suspended a German cleric dubbed the "bling bishop," whose alleged luxury lifestyle runs counter to the message of modesty that Pope Francis aims to impart in the Catholic Church. "The Holy See deems it appropriate to authorize a period of leave from the diocese for Franz-Peter Tebartz-van Elst," the Vatican said in a statement. "A situation has been created in which the bishop can no longer exercise his episcopal duties." It did not specify how long the bishop would have to stay away but stated that this would depend on an analysis of the finances of his diocese in Limburg, in western Germany, and the responsibilities for its high costs. The Central Committee of German Catholics, which brings together all the Catholic lay associations in the country, said it was satisfied with the decision to suspend the bishop. "Pope Francis' decision offers a chance at a new beginning in the diocese of Limburg, where the situation has become heavy in recent weeks both for believers there and for the church in Germany as a whole," Alois Glueck, the organization's president, said. The bishop flew to Rome last week on the low-cost airline Ryanair to explain himself to Francis, following accusations that he had bought an expensive ticket to travel to India and squandered money. His private quarters in a new diocesan building are reported to have cost some $3.9 million and included a 678-square-foot dining room and a $20,600 bathtub -- using the revenue from a religious tax in Germany. Pope watchers are gaining confidence in this new Pope's ability to shake thing up following the resignation of Pope Benedict and the scandals associated with his tenure. Below is a story of a recent impromptu speech given by Pope Francis in Brazil. (Reuters) -- September 22, 2013: Pope Francis made one of his strongest attacks on the global economic system on Sunday, saying it could no longer be based on a "god called money" and urged the unemployed to fight for work. The crowd of about 20,000 people in a square near the city port chanted what Francis called a prayer for "work, work, work". They cheered each time he spoke of the rights of workers and the personal devastation caused by joblessness. "We don't want this globalised economic system which does us so much harm. Men and women have to be at the centre (of an economic system) as God wants, not money. The world has become an idolator of this god called money." Sardinia's coast is famous for its idyllic beaches, exclusive resorts and seaside palatial residences of some of the world's richest people, including former Italian prime minister Silvio Berlusconi and a host of Hollywood actors. "It is not a problem of Italy and Europe ... It is the consequence of a world choice, of an economic system that brings about this tragedy, an economic system that has at its centre an idol which is called money." As he spoke, the crowd cheered; some cried. While Francis's predecessor Benedict also called for changes to economic systems, he was more likely to use dense intellectual language. Francis, who as bishop of Buenos Aires sided with unemployed workers in their conflict with government austerity plans, ended his improvised speech with a prayer asking God to "give us work and teach us to fight for work". Francis said he did not want the crowd to see him as a smiling "cordial manager of the Church who comes here and says to you 'have courage'". "I don't want this. I want this courage to come from inside me and push me to do everything I can as a pastor and a man." Francis brought tears to the eyes of some in the crowd when he told his own family's story of emigration from Italy to Argentina and how they lost everything in the Great Depression. "I was not born yet, but as a child I remember hearing talk of this suffering." Francis said globalization had brought with it a culture where the weakest in society suffered the most and often, those on the fringes "fall away", including the elderly, who he said were victims of a "hidden euthanasia" caused by neglect of those no longer considered productive. "To defend this economic culture, a throwaway culture has been installed. We throw away grandparents, and we throw away young people. We have to say no to his throwaway culture. We want a just system that helps everyone." The Pope may just be starting this revolution, I hope so, but he has a lot of work ahead of him. He needs to start at home in the Vatican and the problems with the Vatican Bank and their investments in the very things that are causing global poverty and unemployment. I know he did not inherit the problems that caused his predecessor to reign. He inherited these things. But the real power behind his recent words means that he must demonstrate some corrective measures in his own earthly kingdom. It's good to see him speak without a script. Jesus never had one. It has to come from the heart. But in doing so, I fear he may be setting himself against the Vatican powers that be (i.e. Jesuits) and we may see another tragedy or assassination attempt. Yesm MarthaD, he IS a Jesuit! And by speaking out he is really taking a risk. I bet they were all freaked out when he said this speech. You're absolutely right to be afraid for him. I don't understand how we can 'fight for work'... He needs to explain that. When I hear a world leader promoting "free energy", ridding the earth of "religion" and the "powers that be" and "money", maybe then I will start listening to them. Francis (Latin: Franciscus; born Jorge Mario Bergoglio; 17 December 1936) is the 266th and current Pope of the Catholic Church, a position also holding the roles of Sovereign of Vatican City and the Bishop of Rome. 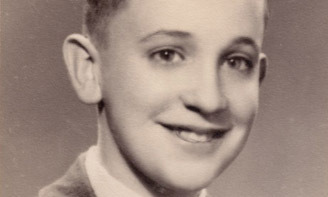 Born in Buenos Aires as the son of Italian parents, Bergoglio worked briefly as a chemical technician before entering seminary. He was ordained a priest in 1969. From 1973 to 1979 he was Argentina's Provincial superior of the Society of Jesus. He became Archbishop of Buenos Aires in 1998, and a cardinal in 2001. 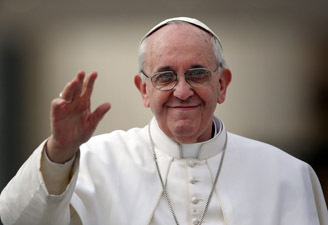 Following the resignation of Pope Benedict XVI, on 13 March 2013 the papal conclave elected Bergoglio, who chose the papal name Francis in honor of Saint Francis of Assisi. Francis is the first Jesuit pope, the first pope from the Americas, and the first from the Southern Hemisphere. Throughout his life, both as an individual and a religious leader, Bergoglio has been noted for his humility, his concern for the poor, and his commitment to dialogue as a way to build bridges between people of all backgrounds, beliefs, and faiths. He is known for having a simpler and less formal approach to the papacy, most notably by choosing to reside in the Domus Sanctae Marthae guesthouse rather than the papal apartments of the Apostolic Palace formerly used by his predecessors. In addition, he is known for favoring simpler vestments void of ornamentation, by starting to refuse the traditional papal mozzetta cape upon his election. Pope Francis has affirmed Catholic teachings on sexual morality. He said that while homosexual acts were sinful, the homosexual orientation was not. He favors a wider active role for women in the Church, but believes the ordination of women into the Catholic priesthood is impossible. In addition, Pope Francis said that it was necessary to listen to young people and admired their non-conformism.